Full eternity rings from Serendipity Diamonds—precision set with natural diamonds. Each full diamond eternity ring features a continuous band of natural polished diamonds, beautifully faceted and styled into an assortment of diamond shapes, widths and precious metal types. Choose between 18ct White Gold, 18ct Yellow Gold, 18ct Rose Gold, 950 Platinum and 950 Palladium for a full and varied choice of exceptional eternity ring styles. Full diamond eternity rings feature a continuous, uninterrupted flow of diamonds all of the way around the ring. Setting styles vary. Full eternity rings create an allure and and impression of luxury with a suite or mixture of diamond shapes chosen for the wearer. 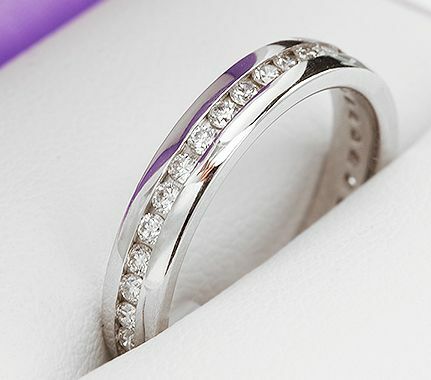 The popularity of the full eternity ring lies predominantly with married couples, cementing a milestone anniversary, or following the birth of a child ( which has coined the term 'maternity rings' for obvious reasons. Such designs are set across various ring widths, typically in flat court or regular court profile bands. The actual profile of the ring is not critical, but the depth of the ring is, where a setting depth appropriate for the depth of the diamond is necessary. Fully set princess cut designs complimented by full eternity ring designs are extremely popular, with mixtures of both stones working nicely due to the flat edge of each of these shapes of diamond.